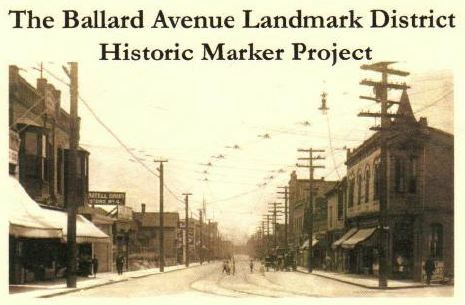 In April 2007, the Ballard Historical Society unveiled Historic Markers on twenty-six buildings located within the Ballard Avenue Landmark District. Want a great tour of Ballard Avenue? Click for a printable BHS Ballard Avenue Landmark Walking Tour. The Ballard Avenue Landmark Historic District holds a significant place in Seattle history. The uniquely-preserved state of Ballard Avenue provides visitors with a window into the heyday of Ballard’s industrial and commercial era of two centuries ago. In addition to the markers, a commemorative plaque engraved with a 1910 image of Ballard Avenue is installed in Marvin Gardens Park at the intersection of Ballard Avenue and 22nd Avenue NW. The installation of the markers on Ballard Avenue enables residents and visitors to interact with the rich history of the City of Ballard. The plaques also highlight the protected status of Ballard Avenue, which was designated a City and National Landmark District in the mid-1970s. The marker project was made possible by a City of Seattle Small and Simple Grant.